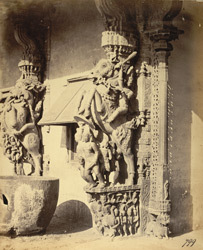 Photograph of a sculptured pillar in the Jalakanteshvara Temple at Vellore in Tamil Nadu, taken by an unknown photographer in c.1870, from the Archaeological Survey of India Collections. The Jalankanteshvara Temple is built in the Vijayanagara style and dates from the 16th century. The complex is enclosed by high walls and is entered on the south through a tall gopura, or gateway. This imposing towered gateway consists of six diminishing storeys; the first two storeys are decorated with mouldings and carvings. This gateway leads to the outer enclosure which contains the kalyana mandapa to the left. The pillars of the mandapa exhibit some of the finest carved pillars of the Vijayanagara period. This is a view of some of the outer pillars fashioned as rearing lions, horses with riders, yalis and other mythical beasts.